Career planning is a lifelong matter. Be it a CV check, internship or Professional Year advice, mock interviews, general orientation or decision-making, career coaching at the Hertie School supports students and alumni in all matters of their career development. Career development at the Hertie School supports students and alumni in all matters related to their career development. Valuable real-world working experience is part of the MPP and MIA programmes. All students complete a summer internship between their first and second year of study. Ideally, the mandatory internship is complemented by the ensuing cooperation between the students and the internship institutions in terms of the master thesis. This final project enables students to work on pressing issues on behalf of the respective institution and to find solutions to topical problems. The Hertie School partners with institutions from all three sectors to offer internship positions. Securing an internship is the responsibility of each student, but the Career Development office provides support where possible. If you want even more working experience, you can apply to complete a full Professional Year between the first and second year of your studies. The Professional Year is not compulsory but offers an excellent opportunity for students to gain professional experience during their studies. 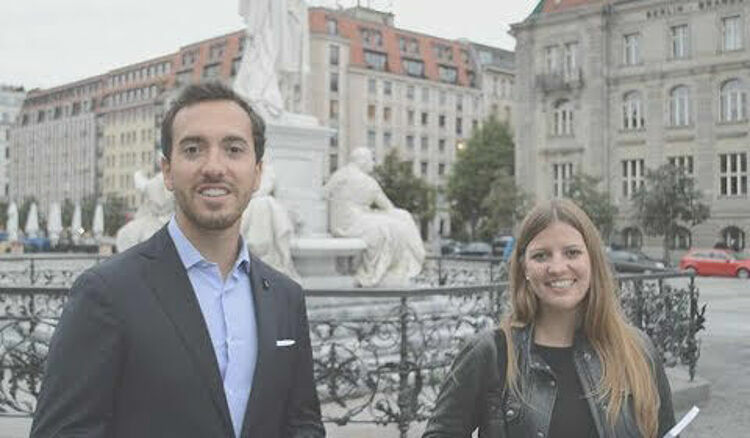 Students who participate in this programme leave the Hertie School of Governance for 9 to 15 months in order to acquire professional experience. The partner institution ascribes suitable tasks to students and pays an appropriate remuneration. After the Professional Year, the students return to the Hertie School to begin their final year of studies. To help you find the position that matches your interests, the school has established relationships with a range of attractive institutions such as ministries, international companies and NGOs. Prospective students interested in gaining work experience in public sector consulting while completing their graduate degree are invited to learn more and to apply to the Integrated Professional Year with public sector consultancy PD. Career planning is a lifelong matter. Be it a CV check, potential analysis, mock interviews, general orientation or decision-making, career coaching at the Hertie School supports students in all matters related to their career development. In individual sessions you receive advice, feedback or coaching on your professional questions. Even after having graduated you can get in touch with Career Development at any time to schedule a meeting for individual coaching – in person, on the phone or via virtual meetings. 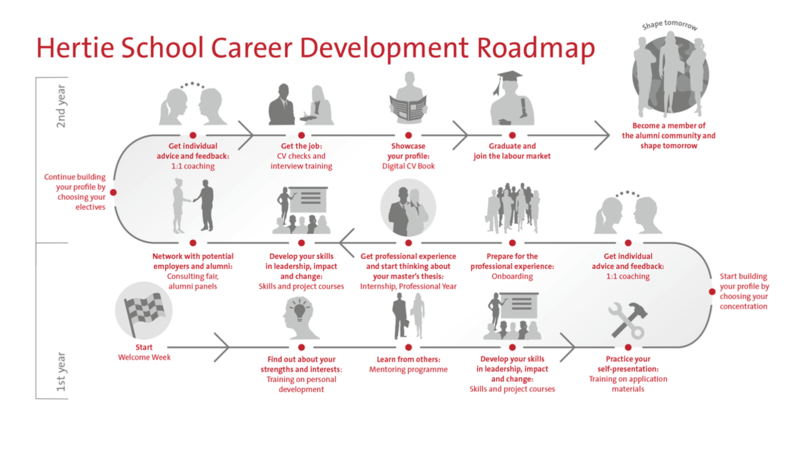 The Hertie School also offers career workshops on topics from self-assessment to interviewing. These extracurricular events focus on current application trends and help you to assess your strengths, develop your career goals, and present yourself in a professional way. For Executive students, we use Check-in breakfasts as a space to facilitate discussion between mid-career professionals and peer-to-peer learning in terms of their next professional steps. We organize a Consulting Fair which is a recruitment fair for large management and public sector consulting firms. In addition, we partner with the Federal Foreign Office’s annual Career Fair for International Organisations and European Institutions, where you can meet with representatives of these institutions and learn more about career options in the field. While studying in Berlin, you also have the opportunity to visit some of the largest job fairs in Europe, such as Connecticum and Made in Berlin. The Professional Perspectives event series gives Hertie School students the opportunity to meet with alumni and other professionals from all sectors. They gain first-hand insights into specific industries, receive career advice and learn more about job opportunities in the respective fields. In company presentations, different firms come to the school to introduce their organization and explain their recruitment process. As Hertie students and alumni you become part of a vibrant and global network of professionals in different sectors. At our annual alumni reunion you get the chance to connect with other alumni, discuss current public policy issues and celebrate. In addition, we host a lively LinkedIn group for our ongoing online exchange on current job opportunities and other career-related topics. Successful graduation from a German university opens up a range of opportunities in the German job market for international graduates. As a graduate of the Hertie School, you are allowed to extend your residence permit for up to 18 months after completing your studies for the purpose of looking for employment. While you have this residence permit for the purpose of looking for work, you are permitted to pursue any occupation. The Hertie School will also offer you opportunities to acquire German language skills during your studies as German sufficiency will make you more attractive to German employers and will significantly widen your possible career paths. Hertie School students come from interdisciplinary backgrounds. Our graduates pursue successful careers in the private, public and civil society sectors. Together, they form the school’s vibrant and global alumni network, which provides lifelong mutual support. Our student and alumni network offers news, events and interesting job openings.